Unified head of the Department of Surgery Dr. Ivar Mendez (photo by David Stobbe). It may sound like fiction, but U of S research is changing the future of medicine. The sun breaks through the blinds and you roll out of bed. Throat is sore and cough is dry. You pick up your tablet and call your doctor by video. You answer a few questions, they listen to your chest, and then you cough into a special sensor connected to your computer device that enables your doctor to diagnose the bacteria or virus that ruined last night's sleep. Before leaving the house you have a prescription. This is the future of health care, 15-20 years from now, that Dr. Ivar Mendez is helping create. "The general theme of my work is how can we use technology to make a difference," said Mendez, unified head of the Department of Surgery at the U of S.
Mendez and his team have focused their attention on three main areas: how technology can narrow the gap of health-care service, how state-of-the-art systems can treat neurological conditions and how 3-D printing can be used to personalize medicine. A big question Mendez has been solving is how technology can help narrow the gap of inequality in health-care delivery. 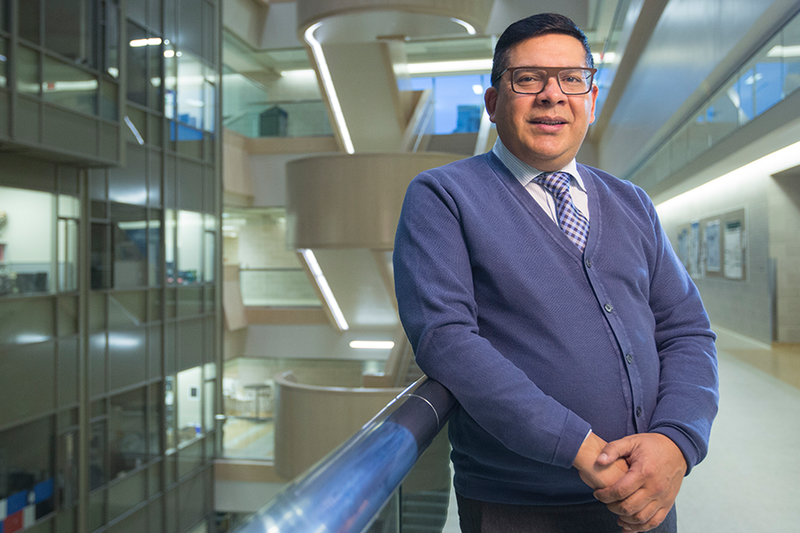 Saskatch­ewan, with its expansive territory and widely dispersed population, presented a perfect location for Mendez to turn his research in remote sensing technology into application. Saskatchewan is big and the majority of its 1.1-million popu­lation lives in the southern part of the province. Not so coinci­dentally, that is also where the bulk of the province's health-care resources—practitioners and facilities—happen to be. This leaves smaller communities, Mendez explained, under served and at risk. "How do we provide service to the most vulnerable segments of the population: children, pregnant women and the elderly? It's a big challenge." Compounding the challenge in Saskatchewan, he continued, is that about 36 per cent of children in the province between the ages of one month and four years live in communities with popula­tions fewer than 1,000 people. To get treatment they have to arrange transportation, which is not efficient in terms of time and money. "I've been working for a number of years on the idea of remote presence technology that enables the expert or physician to provide care where the patient is in real time." To demonstrate this tech­nology, Mendez takes out his smart phone, opens an app, scrolls through a list and selects a robot named Patrick in the Royal University Hospital that can be controlled by his phone. Patrick is equipped with all sorts of high-tech equipment, sensors, a monitor, and a video camera that captures and displays everything in view on Mendez's phone. Mendez directs the robot to proceed to the nursing station. Patrick maneuvers autonomously through the hospital corridors, sensing if people are close by or around the corner, and proceeds with caution to the final desti­nation. Once there, Mendez and a nurse have a conversation in real time, just as he might with a patient. This minute-long demonstration only scratched the surface of the robot's capabilities. "This technology is evolving," said Mendez. "With remote sensing we can now do ultrasounds, listen to hearts, do electrocardiograms. With this technology we can do some blood work and have results in real time with rapid diagnostic tests." The robots—worth about $80,000 each—are now in six communities throughout Saskatchewan, a number Mendez hopes to see increase by leaps and bounds based on the results he has already seen. In Pelican Narrows, a northern community with a population of about 2,700, the robotic system is showing impres­sive results. In collaboration with Dr. Tanya Holt, head of Pediatric Intensive Care, and Dr. Veronica McKinney, director of Northern Medical Services, Mendez has conducted a pilot study using remote presence robots. "In a period over 10 months we took care of the acutely ill children using the robotic system. What we were able to accomplish is 100 per cent of these kids got the initiation of the therapy immedi­ately. The second is that about 70 per cent of these children did not need to be transported here. We were able to take care of them in their own community. That is a huge thing and we are demon­strating here the value of point-of-care medicine." A renowned neurosurgeon, Mendez made a name for himself by looking at how stem cells and technology can be combined to combat incurable conditions such as Parkinson's disease, strokes and other neurological disorders. "I look at how we can use state-of-the-art technology and stem cells to repair the brain. We actually developed the tech­nology—new surgical instru­ments—to implant stem cells in the human brain." His research in brain repair for Parkinson's disease attracted the interest of Harvard Univer­sity and resulted in a decade-long research partnership. "Harvard University wanted to partner with us because we have the technology and know how. Harvard has the knowledge about the cells and we know how to operate on patients and put cells into the human brain." The partnership between Harvard and the U of S, announced this past September, will see Mendez continue to work on cell-based therapy for Parkin­son's that is aimed at restoring cells lost through the disease. The process, Mendez explained, will use stem cells from the patient that will provide the necessary dopamine neurons to enable damaged brain circuitry to be repaired. Mendez began this work in the 1990s and has had promising results. So far, 10 patients with Parkinson's have had cells implanted into their brains as part of a study; all 10 have seen significant improvements. "This is a game changer. This is a platform for the develop­ment of a therapy for incurable diseases that has the potential to benefit millions of people around the world." This past year, Mendez was planning for a complicated surgery that required him to "put electrodes into the brain of a patient with a complex neurolog­ical condition." He normally uses advanced computer software to map out the surgery; this case required more. "To do this advanced neuro­surgical procedure we needed advanced systems of planning, we needed 3-D structures that are identical to the patient's brain," he explained. Mendez worked with Bob Wilson from the Engineering Shop in the College of Engineering, which has equipment that can print in three dimensions using a variety of materials. Mendez brought a team together—Dr. Marla Mickleborough and Chelsea Ekstrand (psychology student), Devin Bradburn (engineering student) and MRI specialist Alain Lalonde—to figure out how to use personal MRIs to print an accurate, see-through representa­tion of the patient's brain. After some trial and error, the group was able to print a semi-lucent model of the brain— including internal nuclear struc­tures—using a rubber material that was a close representation of the brain's texture. The use of 3-D printing, Mendez continued, is going to change health care in substantial ways, including printing organs and other parts of the body. "3-D printing is going to become very important. For example, if someone needs a new knee, instead of buying a new one and trying to fit it to a particular patient, you will actually be able to print the knee of that partic­ular patient just before operating. It is personalized medicine that will allow us to be much more efficient, much more accurate." All of this combines to place the U of S in a pioneering position. "You can see how technology can allow us to provide care to people who don't have access to care, to repair organs, like the brain, of incurable diseases, and develop personalized medicine using 3-D printing technology. Believe it or not, here we are pioneering all these things. We don't have to go anywhere; the world comes to us," said Mendez. In fact, there are applications for this work that may go far beyond the pale blue dot of Earth. Mendez was recently invited to present at the World Health Orga­nization and the United Nation's Office for Outer Space Affairs' General Assembly on "Applica­tions of Space Science and Tech­nology for Public Health." "We were the only univer­sity invited to make a presenta­tion to this group which includes members from all the world's space agencies." Closer to home, Mendez said these pieces come together to provide a glimpse of what the future hospital may look like. "Hospitals of the future will shrink instead of getting bigger. With the use of remote presence technology we may shift the paradigm of centralization of health care." Hospitals around the world face similar issues, he continued. Emergency rooms are full, beds are always occupied and wait times are long. With remote presence technology, "we can change that and do point-of-care treatment and diagnosis. We can decentralize services of hospitals to where the people are in their own communities and potentially in their own houses." This shift means hospitals will mainly deal with the "most acutely ill patients and surgery. Most of the care will be done in the periphery like what has happened in most other industries like banking or the airline industry where they have been able to decentralize."